→Join Us For Our Next First Tuesday! 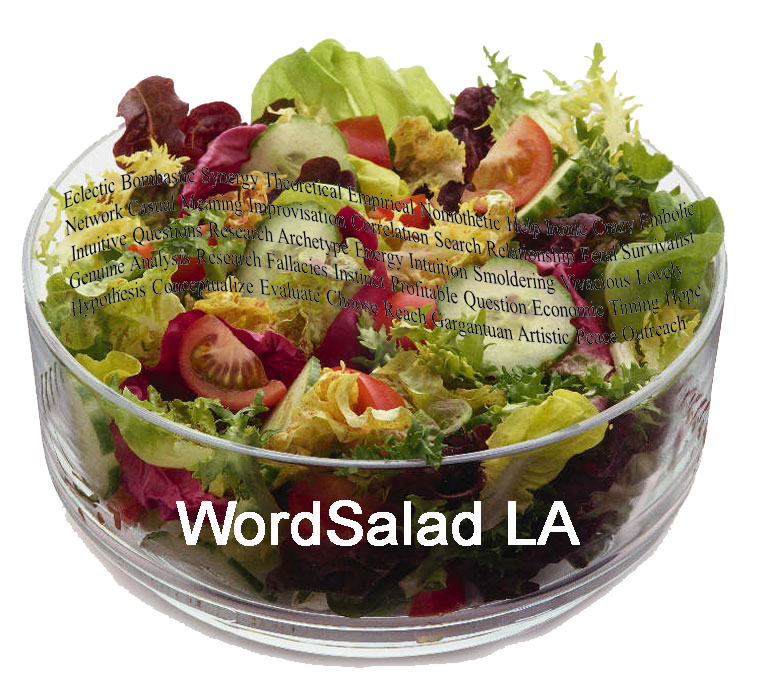 · What is WordSalad LA? WordSalad LA is the art of performance writing. It puts a dual emphasis on content and presentation, encouraging writers to focus on what they're saying, how they're saying it, and how it is received in front of a 'live' audience. · Who gets to participate? If you'd like to read your writings at WordSalad LA, just email us a synopsis of your piece and where you're performed previously. Then come to a show as we ask all performers to come see us first. If you'd like to be an audience member, just come on First Tuesday and we'd love to see you! · How often do they happen? · What is read at WordSalad LA? One of the best things about WordSalad LA is the range of writing it attracts. You'll find a diverse range of work within WordSalad LA, including heartfelt love poetry, searing social commentary, uproarious comic routines, and bittersweet personal confessional pieces. Some nights will have a theme and others will be an electic mix of subjects. · How do I get on the WordSalad LA email list? Just email us at info@WordSaladLA.com and we'll keep you up to date on all of our happenings and events.